Cornucopia, WI – Today, the Food and Drug Administration (FDA) released a draft guidance document to clarify how egg producers, including organic farmers with outdoor access, can comply with its 2009 egg safety rule aimed at reducing salmonella contamination in the nation’s egg supply. 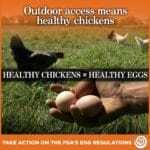 Since organic producers are required by federal standards to grant outdoor access to their laying hens, the guidance applies to all organic egg producers. 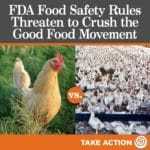 The FDA, which collaborated with the USDA’s National Organic Program in promulgating their guidance, recognizes minute covered porches, which do not afford true and meaningful outdoor access to laying hens, as one of four possible organic production systems and thereby legitimizes their use. Some in the organic community had been concerned that the FDA would require impractical swabbing and disinfecting of the outdoor areas but the draft guidance puts these concerns to rest. 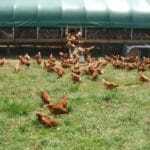 However, other prevention and control measures that are included in the guidance could force organic producers to devote significant additional resources, or may even make it impossible for pastured poultry operations to comply. Stephanie Alexandre, a producer of certified organic, pastured eggs near Crescent City, California, objects to the draft guidance. 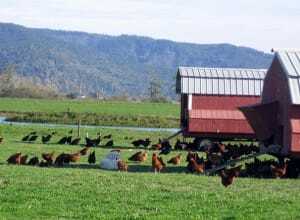 “It’s ironic that federal regulators would apply such scrutiny, and costly and labor-intensive requirements, to my farm when there is abundant published, peer-reviewed research indicating that the real danger to society, from salmonella contamination in eggs, comes from giant industrial operations, generally with caged birds, not with modest sized flocks of pastured poultry,” said the organic farmer. For example, despite weak scientific evidence that contact with wild birds is a significant risk factor for salmonella contamination, the FDA requires organic producers to minimize contact with other birds. 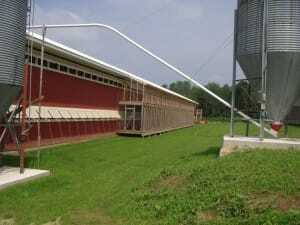 The agency recommends noise cannons, temporary confinement, or netting, or even structures with roofs (porches) which would be cost prohibitive for most organic producers with meaningful outdoor access. In what now appears to be a cynical ploy, the USDA had asked the National Organic Standards Board (NOSB), the expert citizen panel that Congress created to advise the Secretary of Agriculture, to develop standards to help enforce the requirement for outdoor access. Cornucopia is also analyzing a separate pending FDA draft rule that will seriously impact family-scale vegetable growers. If organic farmers and consumers interested in protecting the integrity of the organic label, and possibly the country’s safest agricultural producers, are not already Cornucopia members, they can either join by visiting the organization’s website (for full access to electronic and print publications) or sign up for Cornucopia’s free electronic newsletter: www.cornucopia.org. Either way they will be notified when Cornucopia’s action alert and briefing materials become available.